Sporadic cerebral amyloid angiopathy (CAA) is a common age related cerebral small vessel disease, characterised by progressive deposition of amyloid-β (Aβ) in the wall of small to medium sized arteries, arterioles and capillaries of the cerebral cortex and overlying leptomeninges. Previously considered to be a rare neurological curiosity, CAA is now recognised as an important cause of spontaneous intracerebral haemorrhage and cognitive impairment in the elderly, two fundamental challenges in the field of cerebrovascular disease. Our understanding of the pathophysiology and clinical manifestations of CAA continues to evolve rapidly, with the use of transgenic mouse models and advanced structural and/or molecular neuroimaging techniques. Yet, despite remarkable recent interest, CAA remains under-recognised by neurologists and stroke physicians. In this review, a fresh look at key developments in understanding the complex pathophysiology, important clinical and radiological features, diagnostic approaches and prospects for rational therapies for this enigmatic small vessel disorder is provided. Sporadic cerebral amyloid angiopathy (CAA) is a common small vessel disease of the brain, characterised by the progressive deposition of amyloid-β (Aβ) protein in the walls of small to medium sized arteries (up to about 2 mm in diameter1), arterioles and capillaries in the cerebral cortex and overlying leptomeninges.2 3 CAA can also affect cerebellar vessels but only rarely those in the brainstem or basal ganglia. Although known to pathologists for over a century,4 5 CAA was not linked to clinical disease until as late as the 1960s when it was suggested to be a rare cause of intracerebral haemorrhage (ICH).6–8 In recent years, CAA has been ‘rediscovered’ as a common and important cause of spontaneous ICH, which remains the most devastating form of stroke, with a death rate approaching 50% in contrast with improved outcomes from ischaemic stroke.9 10 An increased understanding of CAA thus holds promise for improved prevention and treatment of ICH. The growing interest in CAA is at least partly thanks to two fields of research, which have been important in defining the expanding clinical–radiological phenotype and the underlying pathophysiology of the disease: (1) neuroimaging, which now allows an unprecedented ability to investigate CAA dynamics in vivo using MRI to reveal complex patterns of cerebral bleeding (including lobar microbleeds11) and ischaemia, and an increasing repertoire of specific amyloid binding ligands3 12–16; and (2) transgenic mouse studies, which have allowed the experimental alteration of amyloid peptide expression and molecular structure, providing significant mechanistic insights. Despite these advances, CAA remains under-recognised by neurologists and stroke physicians, making a fresh look especially timely. In this review (see box 1 for search strategy), we provide a comprehensive update, emphasising the widening spectrum of CAA clinical presentations and neuroimaging features, including diagnostic approaches to reliably identify the disease in vivo. Finally, we discuss improved prospects for rational preventive or disease modifying therapies for this common and devastating microangiopathic disorder. References were identified through PubMed with the search terms: ‘cerebral amyloid angiopathy’; ‘microbleed(s) or microh(a)emorrhage(s) and cerebral amyloid angiopathy’; ‘intracerebral h(a)emorrhage’; and ‘vascular cognitive impairment’ between January 1970 and August 2011. The references from identified articles and the authors' own files were also searched for relevant publications. Only papers published in English were reviewed. The final reference list was chosen on the basis of relevance to the topics covered in this article. Apolipoprotein E (ApoE) alleles are the only known genetic risk factors for sporadic CAA.39 ApoE is a protein with crucial roles in lipoprotein complexes, which regulate lipid metabolism by binding to cell surface receptors and proteins associated with lipid transfer and lipolysis.39 There are three major polymorphisms in the ApoE gene—namely, ɛ4, ɛ2 and ɛ3—resulting in a single amino acid change40 which dramatically alters the functional properties of ApoE isoforms.41 These alleles have a strong dose dependent effect on the risk of developing CAA and its clinical severity. Thus ApoE ɛ4 in both postmortem and clinical series increases the risk of sporadic CAA related lobar ICH; moreover, the number of ɛ4 alleles relates to clinical severity.39 42–44 Individuals carrying the ApoE ɛ2 allele also have an increased risk of CAA related lobar ICH.44 45 Both of these risk alleles are also associated with a younger age of first ICH,46 greater likelihood of haematoma expansion, poorer clinical outcome47 48 and a higher risk of recurrence.49 Furthermore, the two allelic variants interact: patients with both ApoE ɛ2 and ɛ4 alleles have the earliest disease onset and highest risk of early ICH recurrence.49 50 The ɛ2 and ɛ4 alleles might promote CAA related haemorrhage through distinct mechanisms: ɛ4 by promoting Aβ deposition and ɛ2 by inducing structural changes in amyloid laden vessels, making them prone to rupture.47 48 50–52 Other as yet unidentified genetic polymorphisms relating to amyloid metabolic pathways (figure 2A) may also play a role in sporadic CAA, (eg, presenilin-1, neprilysin and transforming growth factor β-1),57–59 and are a topic of ongoing investigation. (A) Amyloid-β (Aβ) production, elimination and deposition in cerebral amyloid angiopathy (CAA). Converging evidence indicates that the major source of Aβ is neuronal. It is generated by sequential cleavage of amyloid precursor protein (APP) by β- and γ-secretases, in proportion to neuronal activity. Aβ is eliminated from the brain by four major pathways: (a) proteolytic degradation by endopeptidases (such as neprilysin and insulin degrading enzyme (IDE)); (b) receptor mediated clearance by cells in the brain parenchyma (microglia, astrocytes and to a lesser extent neurones); (c) active transport into the blood through the blood–brain barrier (BBB); (d) elimination along the perivascular pathways by which interstitial fluid drains from the brain.53 54 Specialised carriers (eg, ApoE) and/or receptor transport mechanisms (eg, the low density lipoprotein receptor (LDLR) and LDLR related protein (LRP1)) are involved in all major cellular clearance pathways. Vascular deposition is facilitated by factors that increase the Aβ40:Aβ42 ratio (while increased Aβ42 leads to oligomerisation and amyloid plaques) and impede perivascular passage. As the clearance mechanisms fail with age, Aβ is increasingly entrapped from the perivascular drainage pathways into the basement membranes of capillaries and arterioles of the brain leading to CAA.55 56 ApoE alleles have a differential effect on different molecular and cellular processes of Aβ production, elimination and deposition in a way that they either increase or decrease the risk of developing CAA. (B) The roles of different ApoE alleles in various pathways in the brain which might contribute in the pathogenesis and pathogenicity of CAA. CAA primarily involves neocortical and leptomeningeal arterioles, to a lesser extent capillaries and, very rarely, venules.3 In contrast with amyloid plaques found in AD—which are predominantly composed of the 42 amino acid residue fragment (Aβ42)—the vascular amyloid in CAA is mostly composed of the more soluble, 40 amino acid fragment (Aβ40), suggesting different pathophysiological mechanisms for pathological deposition (see below).60–63 Cerebral vessels with moderate to severe CAA show an acellular wall thickening with a strongly eosinophilic smudgy appearance on haematoxylin–eosin stained sections.64 Congo red staining, under polarised light, reveals amyloid deposits as ‘apple green’ birefringence (hence the term congophilic angiopathy)2 65 although immunological stains for Aβ are highly specific and now widely used (figure 3). The development of CAA is progressive, with Aβ first appearing in the abluminal aspect of the tunica media, surrounding smooth muscle cells, and in the adventitia (figure 3).2 At the initial stage, the vessel wall structure is intact, but as the disease progresses, there is pan-mural amyloid accumulation and loss of smooth muscle cells.3 In severe CAA, detachment and delamination of the outer part of the tunica media result in the so-called ‘double barrel’ appearance (figure 3)3; fibrinoid necrosis and microaneurysm formation also occur in advanced disease. There may also be microbleeding with perivascular deposition of erythrocytes and blood breakdown products.64 Endothelial cells are usually preserved even in vessels severely affected by CAA.66 Occasionally Aβ is deposited in the surrounding brain parenchyma immediately adjacent to an affected vessel (sometimes called ‘dyshoric CAA’). Histopathological features of cerebral amyloid angiopathy (CAA). (A1–A3) Morphological changes of the vessel walls of leptomeningeal arterioles, as revealed by haematoxylin–eosin staining. In mild and moderate CAA, only minimal structural changes can be detected: in (A2) the arrowhead points to amyloid deposition in the vessel wall. However, in advanced CAA, there are significant structural alterations, the most extreme of which is double barrelling (detachment and delamination of the outer part of the tunica media; bracket in (A3)). (B1–B3) A similar pathological range of CAA related changes in leptomeningeal arterioles using immunohistochemical detection of Aβ. In mild CAA (B1), there is patchy deposition of amyloid in the vessels wall. Moderate CAA shows more dense amyloid deposition which spans the entire vessel wall (B2) while severe CAA shows double balled vessels and endothelial involvement (B3). 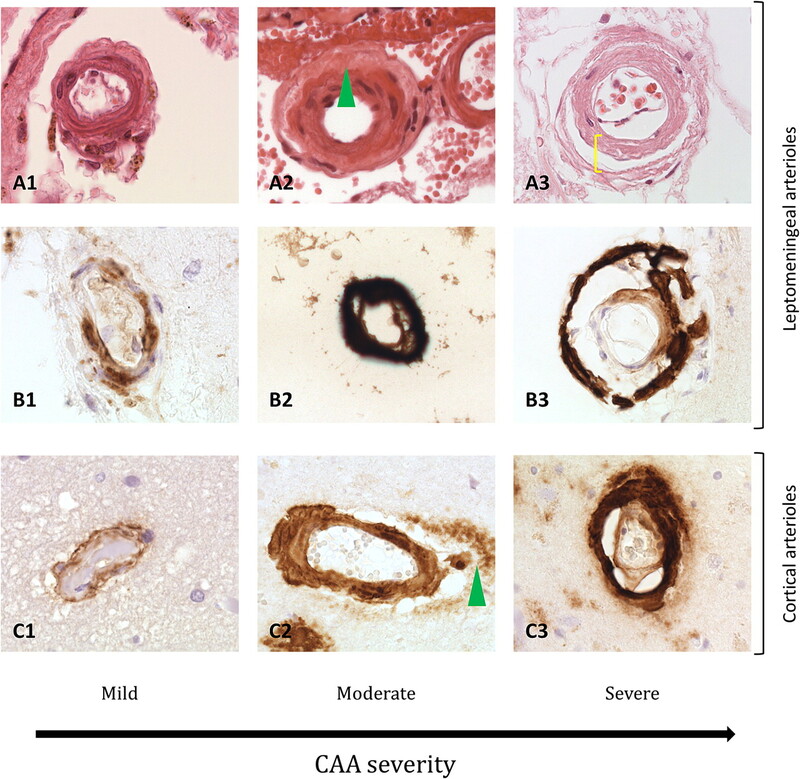 (C1–C3) Pathological findings of CAA in cortical arterioles. C2 shows moderate CAA with pan-mural deposition of Aβ along with Aβ deposition in the surrounding brain parenchyma (arrowhead). In (C3), a double barrel vessel can be seen although this is less common compared with leptomeningeal vessels. CAA is also associated with cerebral ischaemic damage,17 26 67 68 including cortical microinfarcts,69 and white matter pathology (demyelination and gliosis).8 17 62 Microinfarcts are predominantly lobar (cortical–subcortical), usually in patients with severe CAA. One possible mechanism for these ischaemic lesions is occlusion or reduced perfusion in amyloid laden cortical vessels affected by CAA. Sporadic CAA favours posterior cortical regions; the occipital lobe is most frequently affected, followed by the frontal, temporal and parietal lobes.2 3 The occipital lobe is also most severely affected.75 76 The cerebellum can be affected in advanced stages while the basal ganglia, thalami, white matter and brainstem are typically spared.71 The distribution of CAA pathology shows a characteristic patchy pattern,2 so that foci of vessels severely affected by CAA may be adjacent to other with mild or absent Aβ deposition.2 3 The practical consequence of this is that cerebral biopsy may miss patchy CAA pathology. CAA related ICHs have some distinct neuroimaging features, which are shown in figure 4.75 111 However, the clinical presentation of CAA related ICH is similar to other forms of lobar ICH (eg, due to tumours or arteriovenous malformations) and varies according to ICH size and location. Patients usually present with an acute stroke syndrome with focal neurological deficits that may be associated with headache, nausea, vomiting, seizures and/or altered level of consciousness (especially large lobar bleeds).10 There may also be a history of apparently minor head trauma, which might predispose to ICH in individuals with CAA. The typical lobar location of haemorrhage more often leads to acute seizures than in deep ICH. 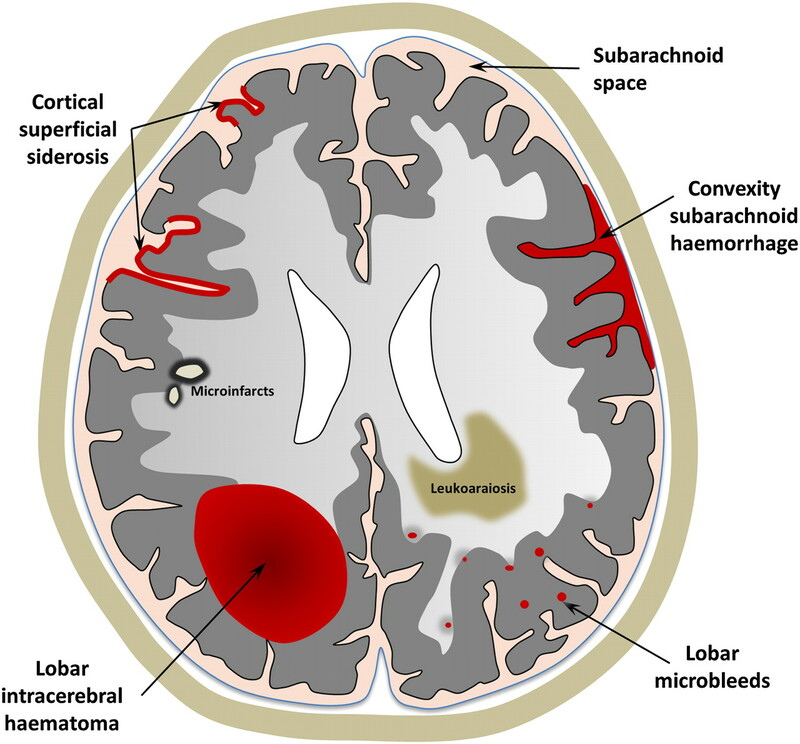 A first ever ICH due to CAA may be relatively mild clinically but this is counterbalanced by the high risk of recurrent haemorrhages; indeed, subsequent ICH (which characteristically may cluster over a short period of time (days to weeks)) is often much more severe.112 In the longer term, survivors of lobar ICH are at higher risk of recurrence compared with deep ICH, with a rate of about 10% per year in elderly cohorts.2 112 Recurrent haemorrhages are typically lobar, often in the same lobe as the initial CAA related bleed.104 Multiple simultaneous lobar haemorrhages are characteristic of CAA related ICH. Recovery from lobar ICH is often poor: negative prognostic factors include older age46 and larger haematoma size113; conversely, a small superficial ICH without intraventricular extension is associated with better outcome. The spectrum of imaging manifestations of sporadic cerebral amyloid angiopathy (CAA). (A) An acute lobar haematoma on CT scan. Some extension of the bleeding in the posterior horn of the left ventricle can be seen. (B) CT scan of a patient with a small posterior cortical haematoma. Acute cortical subarachnoid haemorrhage (cSAH) is evident in two adjacent sulci (arrowheads). (C) A T2 weighted MRI of a patient with probable CAA showing two lobar foci of recent/subacute intracerebral haemorrhage (ICH): in the medial aspect of the left occipital lobe and in the right inferior frontal gyrus. There is also a large old lobar haemorrhage involving the right occipital lobe, some scattered cortical–subcortical cerebral microbleeds (CMBs) in posterior brain regions, as well as confluent white matter hyperintensities in the posterior white matter (leukoaraiosis: arrow). (D) Susceptibility weighted imaging (SWI) and T2* weighted gradient recalled echo (T2*-GRE) (inset) done on the same day in a patient with a lobar haemorrhage. The detection of strictly lobar CMBs (better demonstrated on SWI) is consistent with a diagnosis of probable CAA. (E–F) cSAH (linear hypointensities in the subarachnoid space on T2*-GRE/SWI) and cortical superficial siderosis (hyperintense on T2*-GRE/SWI). The inset in (E) demonstrates the coexistence of cSAH (arrowhead), focal cortical siderosis in an adjacent sulcus (arrow) and some CMBs (circles). Focal cortical siderosis represents the chronic lesion following acute cSAH. (G) SWI in a patient presenting with progressive cognitive impairment led to the detection of multiple strictly lobar microbleeds, characteristic of CAA. Confluent white matter changes (arrow) are also visible. (H) Diffusion weighted imaging (DWI) showing a small acute ‘silent’ ischaemic lesion in the right parietal lobe (arrow) in a patient with probable CAA. CAA may be an important risk factor or cause for ICH related to oral anticoagulation use. Over the past decade there has been a fivefold increase in the incidence of anticoagulant related ICH, which now accounts for about 15% of all ICH.114 This trend is probably due to increasing use of warfarin to prevent cardioembolic stroke in elderly patients with atrial fibrillation. Anticoagulant use per se should not cause ICH if cerebral vessels are intact but the presence of CAA, rendering vessels brittle and fragile, is a plausible aggravating factor for such haemorrhage; an otherwise innocuous minor and self-limiting vessel leak (eg, a cerebral microbleed (CMB), see below) could form a life threatening haematoma if the leaking vessel is damaged by advanced CAA. Evidence supporting a link between CAA and anticoagulation related ICH includes the following observations: first, most such ICH occur with international normalised ratios within the therapeutic range115 suggesting that an intrinsic disorder of cerebral small vessels could be important; and second, the ApoE e2 allele is more common in warfarin related ICH than in patients on warfarin without ICH, supporting a role for CAA.115 Although CAA may underlie a substantial proportion of anticoagulation related haemorrhages, prospective studies with reliable diagnosis of CAA in life (eg, by MRI evidence of lobar CMBs or molecular imaging) in cohorts of patients treated with anticoagulants are urgently needed to answer this question (one large prospective MRI study is currently underway in the UK: http://www.ucl.ac.uk/cromis-2). CAA is thus emerging as a potentially important link between neurodegenerative and cerebrovascular pathology.123 Vascular cognitive impairment and AD are now conceptualised as a continuum118 124 125 with complex interactions and shared risk factors.99 123 CAA seems likely to exacerbate the deleterious effect of neurodegenerative pathology on the brain, lowering the threshold for overt dementia.99 118 Unravelling the independent contribution of CAA to cognitive function is particularly important as it could lead to new therapeutic strategies. After ICH, the next most commonly described clinical presentation of sporadic CAA is with transient neurological episodes,131–133 sometimes termed ‘amyloid spells’. The most common type of attack involves recurrent, stereotyped episodes of ‘positive’ spreading sensory symptoms (paraesthesias).131 132 Although there are a number of small case reports and series,131 132 134 135 no large systematic studies have investigated the prevalence or semiology of these phenomena. At least two other types of transient events have been described: partial motor seizure-like episodes (eg, limb shaking); and visual disturbances (usually positive visual symptoms similar to migrainous auras). Spells are typically brief, almost always less than about 30 min, and usually less than a few minutes. 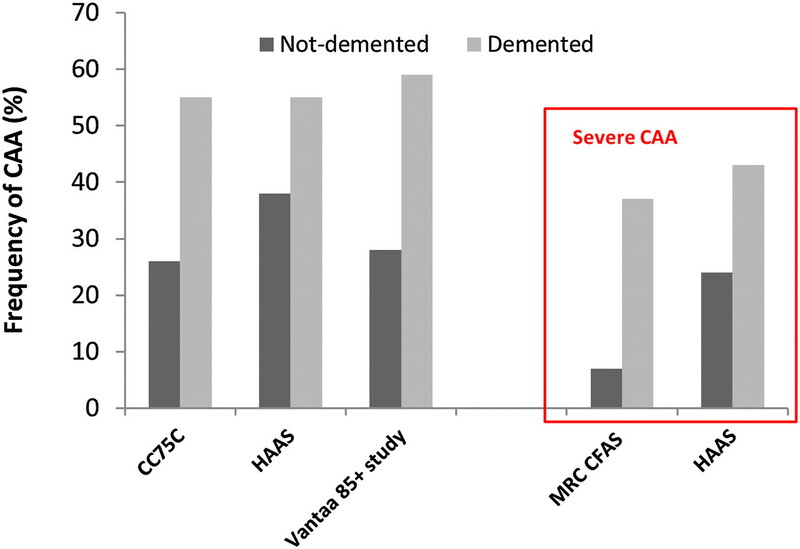 The attacks seem likely to be related to haemorrhagic components of CAA: associated neuroimaging findings reported include CMBs and convexity subarachnoid haemorrhage (cSAH) in the cortical region corresponding to the spell (figure 4E).131 135 The diagnosis of these CAA related attacks is of clinical relevance as they seem to precede serious symptomatic ICH in some patients; antiplatelet or anticoagulant use following such an attack misdiagnosed as a transient ischaemic attack (TIA) could therefore cause potentially avoidable intracranial bleeding. The underlying mechanisms of CAA transient spells remain unclear but could include seizure-like activity (perhaps related to small areas of bleeding—for example, microbleeding, cSAH or superficial siderosis); a direct effect of amyloid or bleeding on local cortical function; or spreading cortical depression.131 The responsiveness of these attacks to antiepileptic drugs as well as their spreading nature in many of the reported cases is in favour of a seizure-like mechanism for their pathophysiology. In a case series by Roth and colleagues,132 four out of six patients with these transient attacks responded to anticonvulsants while the other two patients showed improvement after cessation of antiplatelet therapy. Typical TIA-like episodes have also been reported in CAA133 but whether these are genuinely due to ischaemia and should be treated with antithrombotic agents requires further study. A schematic representation of the spectrum of haemorrhagic and ischaemic manifestations of sporadic cerebral amyloid angiopathy, visible on MRI. Recent population based studies have revealed a high percentage of community dwelling elderly people with strictly lobar microbleeds (particularly in the posterior brain regions), suggesting subclinical CAA.139 140 143 144 This may have important implications: if strictly lobar CMBs are validated as a diagnostic marker of CAA, such asymptomatic individuals could benefit from new therapeutic agents to reduce the progression of the disease. Neuropathological evidence of asymptomatic ischaemic infarction is an established finding in the brains of patients with advanced CAA.8 67–69 Recent studies using magnetic resonance diffusion weighted imaging—which is extremely sensitive to even small areas of acute ischaemia—have shed light on the dynamics of this phenomenon in vivo (figure 4H). A case report13 and a recent case control study12 found a high prevalence of diffusion weighted imaging positive lesions in patients with advanced CAA. 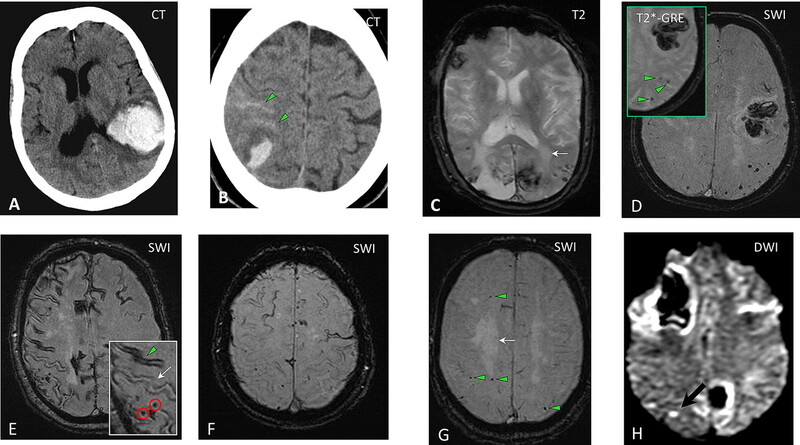 These lesions were associated with CMB burden, suggesting shared pathophysiological pathways.161 Gregoire et al recently established that acute, subclinical ischaemic brain lesions are frequent after recent acute ICH, and are three times more common in CAA related ICH than other spontaneous bleeds35; the lesions were associated with the severity of leukoaraiosis and lobar CMBs, suggesting that they were due to a CAA related occlusive arteriopathy.35 These data suggest a dynamic interplay between the haemorrhagic (‘microbleeding’) and ischaemic (‘microinfarction’) components in CAA161 although the therapeutic implications and prognostic significance of these findings require further study. Exclusion of secondary causes of ICH, such as arteriovenous malformations, head trauma, brain tumour, vasculitis and excessive anticoagulation. Although the value of T2* weighted MRI and SWI in detecting CMBs, cSAH and siderosis has mainly been validated in cohorts of patients who presented with symptomatic ICH, such imaging may also have a role in the diagnosis of patients presenting without major haemorrhage but with other syndromes, raising suspicion of CAA; for example, elderly patients with progressive cognitive impairment.118 135 168 170 171 In addition, although at present T2* MRI or SWI sequences are not part of the routine investigation of TIA-like attacks, there might be useful in patients with CAA related transient focal neurological episodes (‘amyloid spells’)—rather atypical of TIAs (figure 4G).132 135 However, current data are insufficient to make evidence based recommendations. Other biomarkers might also prove useful in the non-invasive diagnosis of CAA, in particular the assessment of Aβ concentrations in CSF. Decreased levels of CSF Aβ42 but not Aβ40 are found in AD172 while it has been reported that both Aβ42 and Aβ40 concentrations are decreased in CAA, relative to control and AD patients.173 It has also been suggested that the combination of low Aβ42 with increased total τ levels in CSF, can discriminate CAA patients from normal controls with high accuracy.173 Another potentially promising marker of CAA might include retinal changes (microaneurysms and dot and blot haemorrhages174). A critical goal of all of these potential approaches is to reliably identify CAA at the early (asymptomatic) stages of the disease, to allow the best chance for disease modifying or preventive treatments to be effective. For the moment, anticoagulation should usually be avoided in patients with a diagnosis of CAA and symptomatic lobar ICH, unless there is a very compelling need to treat that could outweigh the very high risk of recurrent ICH (eg, life threatening pulmonary embolism or a mechanical heart valve). Although antiplatelet drugs probably also increase future ICH risk in CAA, it may be reasonable to consider them in selected patients with CAA for secondary prevention in whom the risk of intracerebral bleeding is judged to be low and the risk of occlusive vascular events high, based on their clinical and imaging characteristics. In primary prevention, the risk/benefit ratio may favour withholding treatment in patients with multiple lobar CMBs. Further randomised clinical trials are urgently needed to help clarify the optimum antithrombotic treatment in these different CAA patient groups. A recent subgroup analysis of the PROGRESS trial reported that lowering blood pressure with the antihypertensive drug perindopril (with or without indapamide) reduced the risk of probable CAA related ICH by 77% (95% CI 19% to 93%) over a follow-up period of 3.9 years.38 Despite a small total number of CAA related ICH events, this is the first trial to show that blood pressure lowering treatment protects against CAA related ICH, regardless of the presence of hypertension.38 Blood pressure lowering may also be associated with a more general benefit in cardiovascular risk and mortality in patients over the age of 80 years.192 Thus most patients with CAA and a history of symptomatic ICH should be offered antihypertensive treatment. An important hope for the future treatment of CAA is to identify patients early in the natural history of the disease before ICH or dementia occurs, to allow the use of disease modifying therapies.197 Given the rarity of the inflammatory variant of CAA, it is unlikely that randomised data will become available to guide treatment, and it therefore seems reasonable to employ anti-inflammatory and immune modulating agents.197 198 However, future treatments for the great majority of sporadic CAA cases are likely to focus on preventing CAA progression by decreasing the production, deposition, toxicity and/or clearance of vascular amyloid. A candidate agent which might delay or inhibit the progression of CAA is tramiprosate, an ionic compound which binds soluble Aβ and interferes with the amyloid cascade.199 Tramiprosate has been shown to be a safe treatment option for patients with suspected CAA in a phase 2 study, supporting future efficacy trials.200 Emerging data from the use of secretases inhibitors and/or immunisation against Aβ in AD will be invaluable in guiding further efforts for disease modification in CAA. During the past decade, there have been tremendous advancements in our understanding of CAA, relating to its pathophysiology, clinical spectrum, imaging manifestations and diagnosis. Sporadic CAA is a common disease of the elderly and will become an increasingly important healthcare challenge as populations age further. Transient neurological spells in CAA may be misdiagnosed as TIAs, but seem to have characteristic clinical features; they need to be recognised as treating them with antithrombotic drugs may increase the risk of future ICH. Recent advances in neuroimaging have provided a new imaging window into the dynamic haemorrhagic and ischaemic features of CAA. Lobar CMBs, cSAH and cortical focal superficial siderosis show promise to reliably diagnose CAA in life, although validation of these findings against their histopathological correlates requires further study. Despite our improved understanding of CAA, there are still many questions to be answered in order to identify targets for therapeutic and preventive interventions. Exciting diagnostic and therapeutic developments are on the horizon for this fascinating small vessel disorder. The authors thank Professor Sebastian Brander for providing some of the pathological images and Dr Estelle Healy for help in describing the histological slides. The authors are also most grateful to Dr Rolf H Jäger, Reader in Neuroradiology and Consultant Neuroradiologist at Queen Square, for assistance with MRI interpretation.
. Histopathology of cerebral microbleeds. In: Werring DJ, ed. Cerebral microbleeds: pathophysiology to clinical practice. Cambridge: Cambridge University Press, 2011:49–64.
. Cerebral amyloid angiopathy. A critical review. Stroke 1987;18:311–24.
. Über “drusige Nekrosen” in der Grosshirnrinde. Neurol Centralbl 1909;28:410–13.
. StudienzurpathologiederhirngefabeII: die drusige entartung der hirnarterien und capillaren. Gesamte Neurol Psychiatr 1938;162:694–715.
. Combined amyloid vascular changes and argyrophilic plaques in the central nervous system. J Neuropathol Exp Neurol 1960;19:370–82.
. Cerebrovascular amyloidosis with cerebral hemorrhage. J Neurol 1977;214:195–206.
. Clinicopathologic studies of primary cerebral amyloid angiopathy. Mayo Clin Proc 1979;54:22–31.
. Advances in the management of intracerebral hemorrhage. Nat Rev Neurol 2010;6:593–601.
. Cerebral microbleeds: detection, mechanisms and clinical challenges. Future Neurol 2011;6:587–611.
. Silent ischemic infarcts are associated with hemorrhage burden in cerebral amyloid angiopathy. Neurology 2009;72:1230–5.
. Neuroimaging demonstration of evolving small vessel ischemic injury in cerebral amyloid angiopathy. Stroke 2009;40:e675–7.
. Imaging of amyloid burden and distribution in cerebral amyloid angiopathy. Ann Neurol 2007;62:229–34.
. Detection of isolated cerebrovascular beta-amyloid with Pittsburgh compound B. Ann Neurol 2008;64:587–91.
. 11C-PIB binding is increased in patients with cerebral amyloid angiopathy-related hemorrhage. Neurology 2010;74:487–93.
. Alzheimer disease and cerebrovascular pathology: an update. J Neural Transm 2002;109:813–36.
. Incidence of cerebrovascular lesions in Alzheimer's disease: a postmortem study. Acta Neuropathol 2003;105:14–17.
. Population studies of sporadic cerebral amyloid angiopathy and dementia: a systematic review. BMC Neurol 2009;9:3.
. Cerebral amyloid angiopathy and its relationship to Alzheimer's disease. Acta Neuropathol 2008;115:599–609.
. Neuropathological findings in the very old. Results from the first 101 brains of a population-based longitudinal study of dementing disorders. Ann N Y Acad Sci 2000;903:490–6. Pathological correlates of late-onset dementia in a multicentre, community-based population in England and Wales. Neuropathology Group of the Medical Research Council Cognitive Function and Ageing Study (MRC CFAS). Lancet MRC CFAS 2001;357:169–75.
. Cerebral amyloid angiopathy and cognitive function: the HAAS autopsy study. Neurology 2002;58:1629–34.
. Cerebral amyloid angiopathy in a 95+ cohort: complement activation and apolipoprotein E (ApoE) genotype. Neuropathol Appl Neurobiol 2005;31:589–99.
. Overlap between pathology of Alzheimer disease and vascular dementia. Alzheimer Dis Assoc Disord 1999;13(Suppl 3):S115–23.
. Cerebral amyloid angiopathy in the brains of patients with Alzheimer's disease: the CERAD experience, Part XV. Neurology 1996;46:1592–6.
. Prevalence of cerebral vascular amyloid-beta deposition and stroke in an aging Australian population: a postmortem study. J Clin Neurosci 2003;10:186–9.
. Diagnosis of cerebral amyloid angiopathy. Sensitivity and specificity of cortical biopsy. Stroke 1997;28:1418–22.
. Congophilic angiopathy and cerebral hemorrhage. Arch Pathol Lab Med 1978;102:317–21.
. Cerebral amyloid angiopathy: a significant cause of cerebellar as well as lobar cerebral hemorrhage in the elderly. J Neurol Sci 1993;116:135–41.
. Intracerebral hemorrhage caused by cerebral amyloid angiopathy in a 53-year-old man. J Neurol 2008;255:597–8.
. Hypertension in adults across the age spectrum: current outcomes and control in the community. JAMA 2005;294:466–72.
. Cerebral amyloid angiopathy without and with cerebral hemorrhages: a comparative histological study. Ann Neurol 1991;30:637–49.
. Acute ischaemic brain lesions in intracerebral haemorrhage: multicentre cross-sectional magnetic resonance imaging study. Brain 2011;134:2376–86.
. Stroke related to cerebral amyloid angiopathy: the significance of systemic vascular disease. J Neurol 1989;236:267–72.
. Lobar hemorrhage in the elderly. The undiminishing importance of hypertension. Stroke 1993;24:49–51.
. Effects of perindopril-based lowering of blood pressure on intracerebral hemorrhage related to amyloid angiopathy: the PROGRESS trial. Stroke 2010;41:394–6.
. Apolipoprotein E in Alzheimer's disease and other neurological disorders. Lancet Neurol 2011;10:241–52.
. Proposed nomenclature of apoE isoproteins, apoE genotypes, and phenotypes. J Lipid Res 1982;23:911–14.
. Apolipoprotein E: far more than a lipid transport protein. Annu Rev Genomics Hum Genet 2000;1:507–37.
. Apolipoprotein E epsilon 4 and cerebral hemorrhage associated with amyloid angiopathy. Ann Neurol 1995;38:254–9.
. Apolipoprotein E-epsilon4 alleles in cerebral amyloid angiopathy and cerebrovascular pathology associated with Alzheimer's disease. Am J Pathol 1996;148:2083–95.
. Variants at APOE influence risk of deep and lobar intracerebral hemorrhage. Ann Neurol 2010;68:934–43.
. High frequency of apolipoprotein E epsilon 2 allele in hemorrhage due to cerebral amyloid angiopathy. Ann Neurol 1997;41:716–21.
. Apolipoprotein E epsilon 4 is associated with the presence and earlier onset of hemorrhage in cerebral amyloid angiopathy. Stroke 1996;27:1333–7.
. APOE genotype and extent of bleeding and outcome in lobar intracerebral haemorrhage: a genetic association study. Lancet Neurol 2011;10:702–9.
. Genetics of intracerebral haemorrhage: a tsunami effect of APOE varepsilon2 genotype on brain bleeding size? Lancet Neurol 2011;10:673–5.
. Apolipoprotein E genotype and the risk of recurrent lobar intracerebral hemorrhage. N Engl J Med 2000;342:240–5.
. Association of apolipoprotein E epsilon2 and vasculopathy in cerebral amyloid angiopathy. Neurology 1998;50:961–5.
. The apolipoprotein E epsilon2 allele and the pathological features in cerebral amyloid angiopathy-related hemorrhage. J Neuropathol Exp Neurol 1999;58:711–18.
. Apolipoprotein E4 promotes the early deposition of Abeta42 and then Abeta40 in the elderly. Acta Neuropathol 2000;100:36–42.
. Human apolipoprotein E4 alters the amyloid-beta 40:42 ratio and promotes the formation of cerebral amyloid angiopathy in an amyloid precursor protein transgenic model. J Neurosci 2005;25:2803–10.
. Mechanism of cerebral beta-amyloid angiopathy: murine and cellular models. Brain Pathol 2006;16:40–54.
. Early-onset and robust cerebral microvascular accumulation of amyloid beta-protein in transgenic mice expressing low levels of a vasculotropic Dutch/Iowa mutant form of amyloid beta-protein precursor. J Biol Chem 2004;279:20296–306.
. Capillary and arterial cerebral amyloid angiopathy in Alzheimer's disease: defining the perivascular route for the elimination of amyloid beta from the human brain. Neuropathol Appl Neurobiol 2003;29:106–17.
. Association of presenilin-1 polymorphism with cerebral amyloid angiopathy in the elderly. Stroke 1997;28:2219–21.
. Cerebral amyloid angiopathy and gene polymorphisms. J Neurol Sci 2004;226:41–4.
. Association of a polymorphism of the transforming growth factor-beta1 gene with cerebral amyloid angiopathy. J Neurol Neurosurg Psychiatry 2005;76:696–9.
. Alzheimer's disease: initial report of the purification and characterization of a novel cerebrovascular amyloid protein. Biochem Biophys Res Commun 1984;120:885–90.
. beta-Amyloid-(1-42) is a major component of cerebrovascular amyloid deposits: implications for the pathology of Alzheimer disease. Proc Natl Acad Sci U S A 1993;90:10836–40.
. Amyloid beta protein (A beta) in Alzheimer's disease brain. Biochemical and immunocytochemical analysis with antibodies specific for forms ending at A beta 40 or A beta 42(43). J Biol Chem 1995;270:7013–16.
. Amyloid beta peptide 1-42 highly correlates with capillary cerebral amyloid angiopathy and Alzheimer disease pathology. Acta Neuropathol 2004;107:283–91.
. Genetics and molecular pathogenesis of sporadic and hereditary cerebral amyloid angiopathies. Acta Neuropathol 2009;118:115–30.
. A review of light, polarization and fluorescence microscopic methods for amyloid. Appl Pathol 1985;3:5–17.
. Sporadic and familial cerebral amyloid angiopathies. Brain Pathol 2002;12:343–57.
. Cerebral infarction in Alzheimer's disease is associated with severe amyloid angiopathy and hypertension. Arch Neurol 1995;52:702–8.
. Cerebral beta amyloid angiopathy is a risk factor for cerebral ischemic infarction. A case control study in human brain biopsies. J Neuropathol Exp Neurol 2000;59:768–73.
. Sporadic cerebral amyloid angiopathy: pathology, clinical implications, and possible pathomechanisms. Acta Neuropathol 2005;110:345–59.
. Two types of sporadic cerebral amyloid angiopathy. J Neuropathol Exp Neurol 2002;61:282–93.
. Capillary cerebral amyloid angiopathy identifies a distinct APOE epsilon4-associated subtype of sporadic Alzheimer's disease. Acta Neuropathol 2010;120:169–83.
. Cerebral amyloid angiopathy: incidence and complications in the aging brain. II. The distribution of amyloid vascular changes. Stroke 1983;14:924–8.
. Topographical distribution of cerebral amyloid angiopathy and its effect on cognitive decline are influenced by Alzheimer disease pathology. J Neurol Sci 2007;257:49–55.
. Cerebral amyloid angiopathy: a systematic review. J Clin Neurol 2011;7:1–9.
. Familial British dementia with amyloid angiopathy: early clinical, neuropsychological and imaging findings. Brain 2000;123:975–91.
. A stop-codon mutation in the BRI gene associated with familial British dementia. Nature 1999;399:776–81.
. A decamer duplication in the 3' region of the BRI gene originates an amyloid peptide that is associated with dementia in a Danish kindred. Proc Natl Acad Sci U S A 2000;97:4920–5.
. Mutation in cystatin C gene causes hereditary brain haemorrhage. Lancet 1988;2:603–4.
. Cerebral amyloid angiopathies: a pathologic, biochemical, and genetic view. J Neuropathol Exp Neurol 2003;62:885–98.
. Charge alterations of E22 enhance the pathogenic properties of the amyloid beta-protein. J Neurochem 2000;74:2209–12.
. Pathogenic effects of D23N Iowa mutant amyloid beta-protein. J Biol Chem 2001;276:32860–6.
. Pathogenic effects of cerebral amyloid angiopathy mutations in the amyloid beta-protein precursor. Ann N Y Acad Sci 2002;977:258–65.
. Dutch, Flemish, Italian, and Arctic mutations of APP and resistance of Abeta to physiologically relevant proteolytic degradation. Lancet 2003;361:1957–8.
. Insights into the pathogenesis and pathogenicity of cerebral amyloid angiopathy. Front Biosci 2009;14:4778–92.
. Mechanisms of cerebrovascular amyloid deposition. Lessons from mouse models. Ann N Y Acad Sci 2000;903:307–16.
. Cerebral amyloid angiopathy: both viper and maggot in the brain. Ann Neurol 2005;58:348–50.
. Lymphatic drainage of the brain and the pathophysiology of neurological disease. Acta Neuropathol 2009;117:1–14.
. Mechanisms to explain the reverse perivascular transport of solutes out of the brain. J Theor Biol 2006;238:962–74.
. Cerebrovascular disease is a major factor in the failure of elimination of Abeta from the aging human brain: implications for therapy of Alzheimer's disease. Ann N Y Acad Sci 2002;977:162–8.
. Cortical and leptomeningeal cerebrovascular amyloid and white matter pathology in Alzheimer's disease. Mol Med 2003;9:112–22.
. Blood–brain barrier and cerebral small vessel disease. J Neurol Sci 2010;299:66–71.
. Occurrence and co-localization of amyloid beta-protein and apolipoprotein E in perivascular drainage channels of wild-type and APP-transgenic mice. Neurobiol Aging 2007;28:1221–30.
. Hypothetical model of dynamic biomarkers of the Alzheimer's pathological cascade. Lancet Neurol 2010;9:119–28.
. Beta-amyloid, blood vessels, and brain function. Stroke 2009;40:2601–6.
. Alzheimer's dementia by circulation disorders: when trees hide the forest. Nat Cell Biol 2009;11:114–16.
. Neurovascular regulation in the normal brain and in Alzheimer's disease. Nat Rev Neurosci 2004;5:347–60.
. Inflammation and white matter damage in vascular cognitive impairment. Stroke 2009;40:S20–3.
. White matter damage is associated with matrix metalloproteinases in vascular dementia. Stroke 2001;32:1162–8.
. Spatial clustering of hemorrhages in probable cerebral amyloid angiopathy. Ann Neurol 2005;58:459–62.
. Cerebral amyloid angiopathy-related hemorrhages. Neurol Sci 2008;29(Suppl 2):S260–3.
. Cerebral amyloid angiopathy: a common cause of cerebral hemorrhage. Curr Med Chem 2009;16:2498–513.
. Association between severe cerebral amyloid angiopathy and cerebrovascular lesions in Alzheimer disease is not a spurious one attributable to apolipoprotein E4. Arch Neurol 2000;57:869–74.
. Role of cerebral amyloid angiopathy in intracerebral hemorrhage in hypertensive patients. Neurology 2005;64:1233–7.
. Sporadic cerebral amyloid angiopathy is not a frequent cause of spontaneous brain hemorrhage. Eur J Neurol 2007;14:923–8.
. Unexpectedly low prevalence of intracerebral hemorrhages in sporadic cerebral amyloid angiopathy: an autopsy study. J Neurol 2008;255:70–6.
. Subarachnoid haemorrhage in the elderly: a necropsy study of the association with cerebral amyloid angiopathy. J Neurol Neurosurg Psychiatry 1993;56:543–7.
. Recurrence of bleeding in patients with primary intracerebral hemorrhage. Stroke 1995;26:1189–92.
. Warfarin, hematoma expansion, and outcome of intracerebral hemorrhage. Neurology 2004;63:1059–64.
. The increasing incidence of anticoagulant-associated intracerebral hemorrhage. Neurology 2007;68:116–21.
. Warfarin-associated hemorrhage and cerebral amyloid angiopathy: a genetic and pathologic study. Neurology 2000;55:947–51.
. Cerebral amyloid angiopathy and thrombolysis-related intracerebral haemorrhage. Lancet Neurol 2004;3:484–92.
. Clinical features and pathogenesis of intracerebral hemorrhage after rt-PA and heparin therapy for acute myocardial infarction: the Thrombolysis in Myocardial Infarction (TIMI) II Pilot and Randomized Clinical Trial combined experience. Neurology 1995;45:649–58.
. Cerebral amyloid angiopathy pathology and cognitive domains in older persons. Ann Neurol 2011;69:320–7.
. Cerebral microbleeds and vascular cognitive impairment. J Neurol Sci 2010;299:131–5.
. Cerebral microinfarcts associated with severe cerebral beta-amyloid angiopathy. Brain Pathol 2010;20:459–67.
. Spatial distribution of white-matter hyperintensities in Alzheimer disease, cerebral amyloid angiopathy, and healthy aging. Stroke 2008;39:1127–33.
. The overlap between neurodegenerative and vascular factors in the pathogenesis of dementia. Acta Neuropathol 2010;120:287–96.
. Shifts in thinking about dementia. JAMA 2008;300:2172–3.
. Changing perspectives regarding late-life dementia. Nat Rev Neurol 2009;5:649–58.
. Cerebral amyloid angiopathy related inflammation: three case reports and a review. J Neurol Neurosurg Psychiatry 2011;82:20–6.
. Acute disseminated encephalomyelitis following vaccination against human papilloma virus. Neurology 2009;72:2132–3.
. Course of cerebral amyloid angiopathy-related inflammation. Neurology 2007;68:1411–16.
. Neuropathology of human Alzheimer disease after immunization with amyloid-beta peptide: a case report. Nat Med 2003;9:448–52.
. Neuropathology and pathogenesis of encephalitis following amyloid-beta immunization in Alzheimer's disease. Brain Pathol 2004;14:11–20.
. The clinical spectrum of cerebral amyloid angiopathy: presentations without lobar hemorrhage. Neurology 1993;43:2073–9.
. Transient neurologic symptoms related to cerebral amyloid angiopathy: usefulness of T2*-weighted imaging. Cerebrovasc Dis 2005;20:412–14.
. Cerebral amyloid angiopathy presenting as transient ischemic attacks. Case report. J Neurosurg 1985;63:963–4.
. Cerebral amyloid angiopathy as cause of convexity SAH in elderly. Neurologist 2010;16:37–40.
. Cortical subarachnoid haemorrhage in the elderly: a recurrent event probably related to cerebral amyloid angiopathy. Eur J Neurol 2011;18:597–603.
. Cerebral microbleeds: a guide to detection and interpretation. Lancet Neurol 2009;8:165–74.
. Correlation of hypointensities in susceptibility-weighted images to tissue histology in dementia patients with cerebral amyloid angiopathy: a postmortem MRI study. Acta Neuropathol 2010;119:291–302.
. Prevalence and risk factors of cerebral microbleeds: an update of the Rotterdam scan study. Stroke 2010;41:S103–6.
. Prevalence and risk factors of cerebral microbleeds: the Rotterdam Scan Study. Neurology 2008;70:1208–14.
. Spatial relation between microbleeds and amyloid deposits in amyloid angiopathy. Ann Neurol 2010;68:545–8.
. Hemorrhage burden predicts recurrent intracerebral hemorrhage after lobar hemorrhage. Stroke 2004;35:1415–20.
. Cerebral microbleeds: prevalence and associations with cardiovascular risk factors in the Framingham Study. Stroke 2004;35:1831–5.
. Cerebral microbleeds in the population based AGES-Reykjavik study: prevalence and location. J Neurol Neurosurg Psychiatry 2008;79:1002–6.
. Cerebral microbleeds in familial Alzheimer's disease. Brain. Published Online First: 17 June 2011. doi:awr126 [pii] 10.1093/brain/awr126.
. Heterogeneity of small vessel disease: a systematic review of MRI and histopathology correlations. J Neurol Neurosurg Psychiatry 2010;82:126–35.
. Counting cavitating lacunes underestimates the burden of lacunar infarction. Stroke 2010;41:267–72.
. Leukoaraiosis and stroke. Stroke 2010;41:S139–43.
. Distribution of white matter hyperintensity in cerebral hemorrhage and healthy aging. J Neurol. Published Online First: 30 August 2011. doi:10.1007/s00415-011-6218-3.
. White matter lesions, cognition, and recurrent hemorrhage in lobar intracerebral hemorrhage. Neurology 2004;63:1606–12.
. Progression of white matter lesions and hemorrhages in cerebral amyloid angiopathy. Neurology 2006;67:83–7.
. Subarachnoid hemosiderosis and superficial cortical hemosiderosis in cerebral amyloid angiopathy. AJNR Am J Neuroradiol 2008;29:184–6.
. Atraumatic convexal subarachnoid hemorrhage: clinical presentation, imaging patterns, and etiologies. Neurology 2010;74:893–9.
. Isolated acute nontraumatic cortical subarachnoid hemorrhage. AJNR Am J Neuroradiol 2010;31:1355–62.
. The clinical conundrum of convexal subarachnoid hemorrhage. Neurology 2010;74:874–5.
. Clinical presentation, etiology, and long-term prognosis in patients with nontraumatic convexal subarachnoid hemorrhage. Stroke 2011;42:3055–60.
. Prevalence of superficial siderosis in patients with cerebral amyloid angiopathy. Neurology 2010;74:1346–50.
. Superficial siderosis. Neurology 2006;66:1144–52.
. Red meets white: do microbleeds link hemorrhagic and ischemic cerebrovascular disease? Neurology 2009;73:1614–15.
. The use of PET in Alzheimer disease. Nat Rev Neurol 2010;6:78–87.
. Molecular imaging with Pittsburgh Compound B confirmed at autopsy: a case report. Arch Neurol 2007;64:431–4.
. Cerebral microbleeds in relation to cerebral amyloid angiopathy. In: Werring DJ, ed. Cerebral microbleeds: pathophysiology to clinical practice. Cambridge: Cambridge University Press, 2011:109–16.
. Susceptibility-weighted imaging: technical aspects and clinical applications, part 2. AJNR Am J Neuroradiol 2009;30:232–52.
. Imaging cerebral microbleeds using susceptibility weighted imaging: one step toward detecting vascular dementia. J Magn Reson Imaging 2010;31:142–8.
. MR imaging detection of cerebral microbleeds: effect of susceptibility-weighted imaging, section thickness, and field strength. AJNR Am J Neuroradiol 2009;30:338–43.
. Routine use of gradient-echo MRI to screen for cerebral amyloid angiopathy in elderly patients. AJR Am J Roentgenol 2004;182:1547–50.
. Current state and future directions of neurochemical biomarkers for Alzheimer's disease. Clin Chem Lab Med 2007;45:1421–34.
. Cerebrospinal fluid amyloid beta(40) is decreased in cerebral amyloid angiopathy. Ann Neurol 2009;66:245–9.
. Retinal vascular abnormalities in patients with cerebral amyloid angiopathy. Cerebrovasc Dis 2009;28:618–22.
. The second (main) phase of an open, randomised, multicentre study to investigate the effectiveness of an intensive blood pressure reduction in acute cerebral haemorrhage trial (INTERACT2). Int J Stroke 2010;5:110–16.
. Surgical trial in lobar intracerebral haemorrhage (STICH II) protocol. Trials 2011;12:124.
. Surgical experience with cerebral amyloid angiopathy. Stroke 1990;21:1545–9.
. Surgical considerations in cerebral amyloid angiopathy. Neurosurgery 1991;29:712–18.
. Postoperative outcome of 37 patients with lobar intracerebral hemorrhage related to cerebral amyloid angiopathy. Stroke 1999;30:29–33.
. Guidelines for the management of spontaneous intracerebral hemorrhage: a guideline for healthcare professionals from the American Heart Association/American Stroke Association. Stroke 2010;41:2108–29.
. Safety and tolerability of NXY-059 for acute intracerebral hemorrhage: the CHANT Trial. Stroke 2007;38:2262–9.
. Gavestinel does not improve outcome after acute intracerebral hemorrhage: an analysis from the GAIN International and GAIN Americas studies. Stroke 2005;36:1006–10.
. Mechanisms of brain injury after intracerebral haemorrhage. Lancet Neurol 2006;5:53–63.
. Deferoxamine mesylate: a new hope for intracerebral hemorrhage: from bench to clinical trials. Stroke 2009;40:S90–1.
. Neuroprotective strategies for intracerebral hemorrhage: trials and translation. Stroke 2010;41:S99–102.
. Aspirin and recurrent intracerebral hemorrhage in cerebral amyloid angiopathy. Neurology 2010;75:693–8.
. Brain microbleeds as a potential risk factor for antiplatelet-related intracerebral haemorrhage: hospital-based, case-control study. J Neurol Neurosurg Psychiatry 2010;81:679–84.
. Cerebral microbleeds are a risk factor for warfarin-related intracerebral hemorrhage. Neurology 2009;72:171–6.
. Patient-specific decision-making for warfarin therapy in nonvalvular atrial fibrillation: how will screening with genetics and imaging help? Stroke 2008;39:3308–15.
. Antithrombotic drug use, cerebral microbleeds, and intracerebral hemorrhage: a systematic review of published and unpublished studies. Stroke 2010;41:1222–8.
. Blood pressure control in the Hypertension in the Very Elderly Trial (HYVET). J Hum Hypertens. Published Online First: 10 March 2011. jhh201110 [pii] 10.1038/jhh.2011.10.
. High-dose atorvastatin after stroke or transient ischemic attack. N Engl J Med 2006;355:549–59.
. Hemorrhagic stroke in the Stroke Prevention by Aggressive Reduction in Cholesterol Levels study. Neurology 2008;70:2364–70.
. Statin use following intracerebral hemorrhage: a decision analysis. Arch Neurol 2011;68:573–9.
. Statins after intracerebral hemorrhage: to treat or not to treat. Arch Neurol 2011;68:565–6.
. Steroid responsive encephalopathy in cerebral amyloid angiopathy: a case report and review of evidence for immunosuppressive treatment. J Neuroinflammation 2010;7:18.
. Cerebral amyloid angiopathy related vasculitis: successful treatment with azathioprine. J Neurol 2010;257:2103–5.
. Targeting soluble Abeta peptide with tramiprosate for the treatment of brain amyloidosis. Neurobiol Aging 2007;28:537–47.
. A phase 2 study of tramiprosate for cerebral amyloid angiopathy. Alzheimer Dis Assoc Disord 2006;20:269–74. Funding AC receives research support from the Greek State Scholarship Foundation. DJW receives research support from the Department of Health/Higher Education Funding Council for England (Clinical Senior Lectureship Award) and the Stroke Association. This work was undertaken at UCLH/UCL who received a proportion of funding from the Department of Health's NIHR Biomedical Research Centres funding scheme.